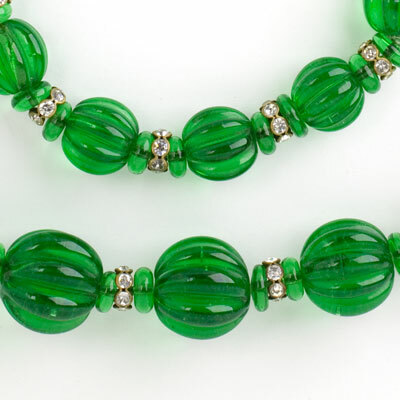 Graduated melon-shaped emerald-green glass beads with green-glass spacers and rhinestone rondelles form this statement piece. 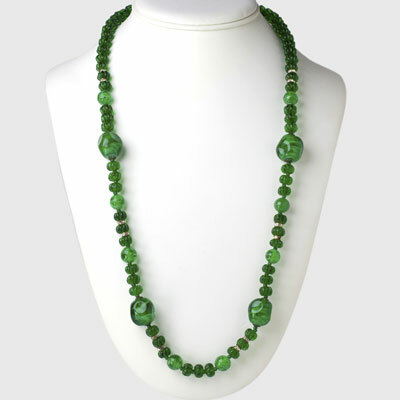 It has substantial weight, is a stunning color and was made to be worn in a single long (30″) strand. 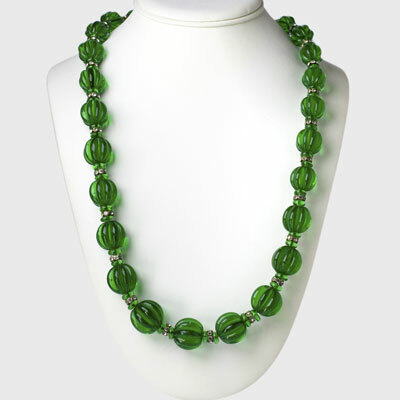 This necklace was recently professionally restrung without a clasp. 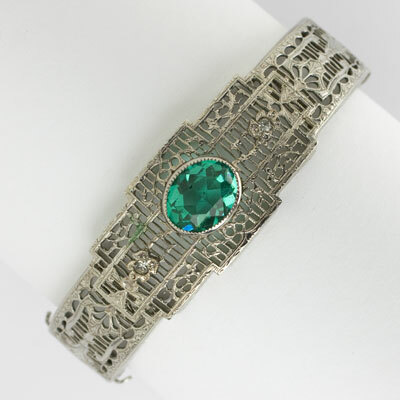 A faceted oval-shaped emerald-glass stone is the centerpiece of this beautifully-detailed silver metal filigree Art Deco bangle bracelet. A small diamanté is on either side of the center. What a lovely example of 1920s workmanship! 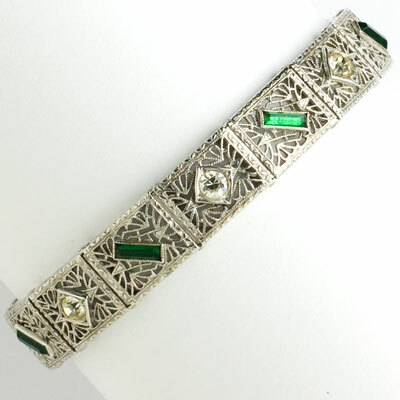 This bracelet has an extension piece that holds the bracelet together while you put it on. 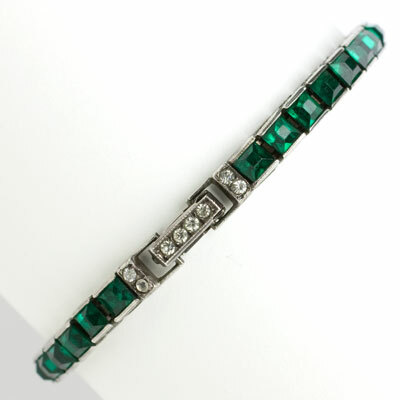 You could wear this bracelet with any of my Art Deco emerald necklaces and brooches — scroll down to see a selection. 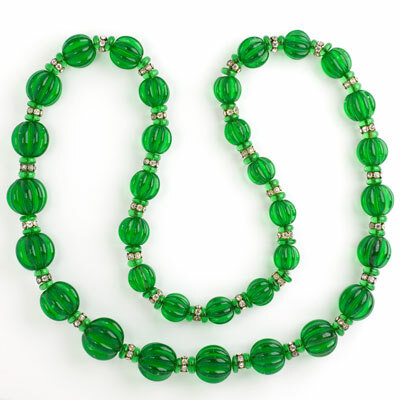 Large emerald-art-glass-swirled nuggets with Russian-gold end-caps are separated by round and melon-shaped emerald-glass beads, rhinestone rondelles and small bead spacers in this classic necklace by Frank Hess for Miriam Haskell. This opera-length beauty closes with a box clasp topped with rose montées. 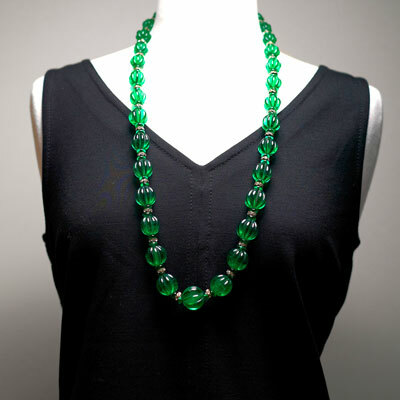 This necklace is versatile and timeless!